On the face of it, this is a fascinating story about how an intrepid young science reporter attempted to uncover the true story on how some cancer cells taken from a dying patient in 1951, led directly to the development of polio vaccines, chemotherapy, cloning, gene mapping, in vitro fertilization, drugs to combat leukemia, herpes, influenza, hemophilia, Parkinson’s disease, sexually transmitted viruses and many more. But what raises this story above the genre of just quality biography and science reporting is a 10-year long quest for the personal story that lay behind the science that raises issues regarding, not only scientific research, but also ethics, race, class, and faith. 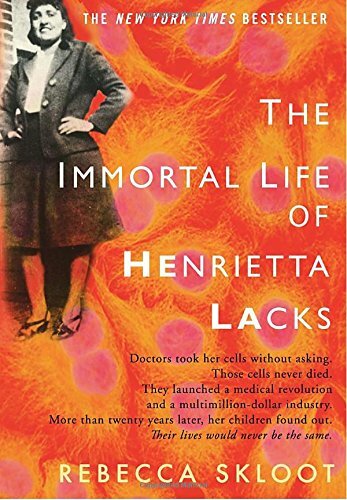 This is how the story existed for 38 years until a factoid in her beginning biology class in community college intrigued the author, Rebecca Skloot, and started her on an adventure to find the person behind the famous “Hela” cells. The story of this decade long search would take the author through science labs, mental institutions, churches and hospitals with a cast of characters that would include Nobel laureates, grocery store clerks, convicted felons, storefront preachers and professional scam artists. The author would quickly discover that the family of Henrietta Lacks had no idea about her cells and their importance for nearly 25 years after her death, until Henrietta’s granddaughter happened to accidentally discover the information while discussing a friend’s work in a lab at John Hopkins University. The story then becomes the long tortuous saga of the author’s attempts to gain the trust of Deborah Lacks, Henrietta’s daughter, who not only has the sole remaining copy of Henrietta’s medical records but also is the gatekeeper into the Lacks family itself. But to gain that trust, the author had to overcome the fear and skepticism of a poor, superstitious, uneducated black family ill-treated by doctors, researchers and society as a whole. The true stories of the barbaric medical experiments on blacks such as the infamous Tuskegee syphilis experiments, along with unfounded rumors of a more recent vintage at John Hopkins, were never far from the Lacks’ family mind. This beautifully rendered story ultimately leaves us with the question that often perplexed the Lacks family itself - how could Henrietta’s cells make millions for biotech companies who sold them, while many of Henrietta’s descendants could not afford health insurance and Henrietta herself would lie buried in an unmarked grave.